There are numerous causes of hearing loss in infancy, for example, a family history of hearing problems, low birth weight or ear infections. By identifying hearing-impaired children at a very young age, health professionals can help families more quickly to ensure their children can communicate well with other people. 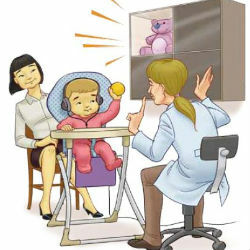 The critical period for learning language is before a child’s second birthday. To learn a language children need to hear properly, so parents should be concerned if their child's language development is late. For more information on you child's hearing or to print out our brochure on the subject, please click here.